PVMBG reported that observers at a post located in Kampung Ropa, Keliwumbu Village, noted that during 30 December 2015-13 January 2016 diffuse white plumes rose as high as 150 m above Paluweh. Seismicity remained relatively stable, and was characterized by shallow and deep volcanic earthquakes, and signals indicating emissions and avalanches. The Alert Level remained at 2 (on a scale of 1-4). Residents and tourists were reminded not to approach the summit within a radius of 1.5 km. Mount Rokatenda, or Paluweh, on the island of Palu'e, lies north of the primary volcanic arc that cuts across Flores Island in Indonesia's Lesser Sunda Islands, and has seen infrequent activity in modern times. The previous eruption in 1985 from a summit lava dome spread 3 cm of ash over villages on the W side of the island. This report is a summary of the October 2012 to August 2013 eruption, and an update through 2016 that includes information provided by Pusat Vulkanologi dan Mitigasi Bencana Geologi (PVMBG, also known as Indonesian Center for Volcanology and Geological Hazard Mitigation, CVGHM), the Darwin Volcanic Ash Advisory Center (VAAC), and the University of Hawai'i's MODVOLC thermal alert reporting system. Numerous news reports also covered the major explosions during 2013. Two brief periods of increased seismicity in April 2009 and January 2012 were the only recorded activity at Paluweh since 1985, prior to an eruption that began in October 2012 and continued through August 2013. PVMBG noted the beginning of lava dome growth on 8 October. A substantial number of MODVOLC thermal alert pixels from MODIS satellite data were first recorded on 11 October 2012 and recurred regularly through 20 July 2013. The first ash plumes were reported by the Darwin VAAC on 11 November 2012 and continued several times each month through May 2013, and then again in late June and during 10-12 August. Plumes generally rose to 2-3 km and drifted between 50 and 100 km in various directions, although a large ash plume on 3 February 2013 rose to higher than 13 km and drifted over 500 km SE, S and SW, briefly impacting air travel in NW Australia. A major explosion on 10 August 2013 created a large pyroclastic flow to the NW from the summit that killed five people on the beach. No further explosions were specifically dated after 12 August 2013, and seismicity gradually decreased over the next several months. Activity during October 2012-April 2013. PVMBG noted lava dome growth, incandescent avalanches, pyroclastic flows, and ash plumes during October 2012 through January 2013. 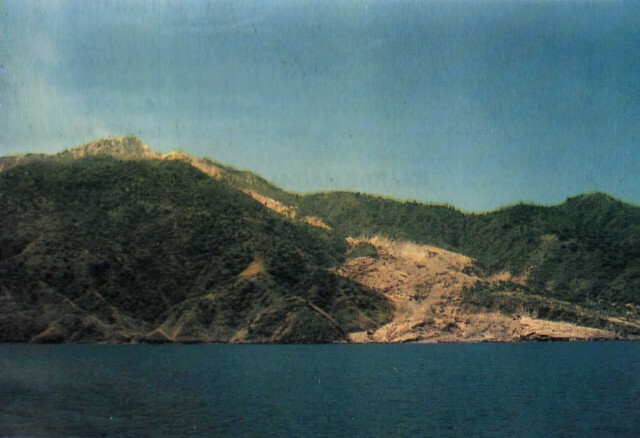 Ejecta as large as 6 cm in diameter was deposited up to 3 km from the summit, and ashfall affected the entire island, averaging 2 cm thick in places; lahars and ash damaged homes and infrastructure on the island (BGVN 39:01). A large eruption on 2 February 2013, which produced a 13-km-high ash plume the next day, generated a substantial SO2 signature, pyroclastic flows to the S and SW, and avalanches. Residents of eight villages were evacuated and significant ashfall was reported up to 1 mm thick in Ende (60 km S on East Nusa Tenggara Island). Thick ashfall was also reported in Ona (SE part of the island) and thin deposits were reported in other areas of the island to the W, N, and E. During a field expedition on 7 February, PVMBG staff observed that about 25% of the S portion of the dome was lost; the lava-dome volume had been an estimated 5.1 million cubic meters on 13 January, prior to the explosion. After the large early February 2013 explosion, many intermittent low-level ash emissions continued through the last week in May, with over 175 VAAC reports issued from the Darwin VAAC during the period. NASA's Earth Observatory (EO) identified an ash plume in MODIS satellite images drifting over 440 km SW on 24 March 2013, and discoloration of the seawater from ash W of the island (figure 7). Figure 7. 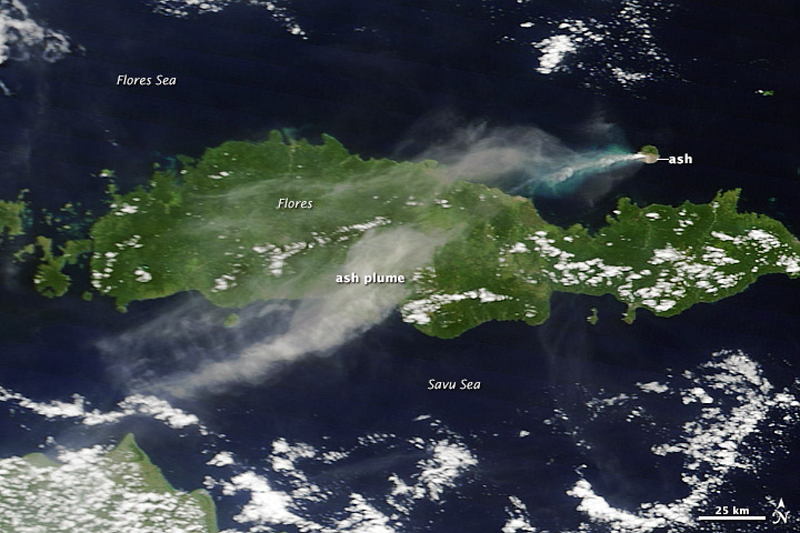 NASA image acquired 24 March 2013 with the MODIS instrument shows an ash plume from Paluweh drifting over 440 km SW across Flores Island. Light-colored ash coats the southern third of Paluweh Island, and the ocean to the W of the island is colored turquoise from ash floating near the water's surface. Image posted at http://earthobservatory.nasa.gov/NaturalHazards/view.php?id=80737. Courtesy of NASA, GSFC. Another NASA-EO image captured on 19 April 2013 shows the extent of ash deposits covering areas of the S and E sides of the summit where the plumes most commonly drift. A delta extending S into the Flores Sea, which was visible in imagery on 12 February and likely created by a pyroclastic flow during the large 2-3 February explosion (figure 8), was also visible. Figure 8. NASA-EO image of Paluweh captured 19 April 2013. 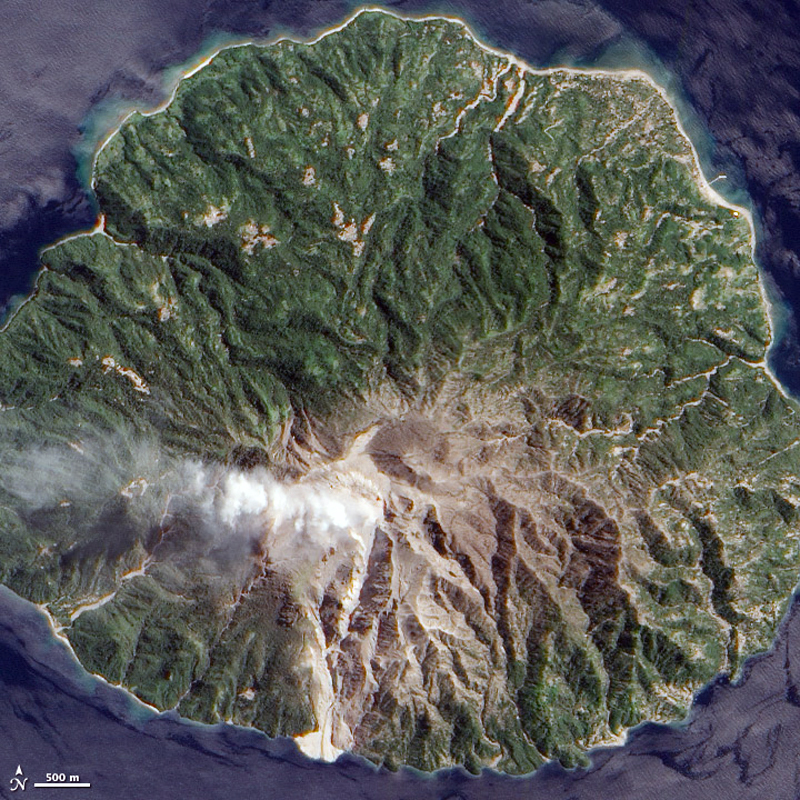 Note the extent of ash covering the area of the island on the S and E sides of the summit where the plumes usually drift. It also shows a delta extending S into the Flores Sea, also visible in imagery on 12 February (http://earthobservatory.nasa.gov/IOTD/view.php?id=80422 ) and likely created by a pyroclastic flow during the large 2-3 February explosion. Courtesy of NASA Earth Observatory (ihttp://earthobservatory.nasa.gov/NaturalHazards/view.php?id=80987). Activity during May-August 2013. There was a three-week break in reported ash plumes between 25 May and 19 June when a low level plume rising to 2.4 km was observed drifting 37 km SE. After this, no further activity was reported until 10 August. A large and deadly explosion took place on 10 August, producing an ash plume that rose to 4.3 km and drifted 130 km W. Details of the explosion are given in BGVN 39:01 and additional information is provided in this report. According to PVMBG, a substantial pyroclastic flow traveled NW from the summit down the Ojaubi drainage towards a village on the beach and killed five fisherman. Rescuers noted that the ground was hot and covered with 10-20 cm of ash. 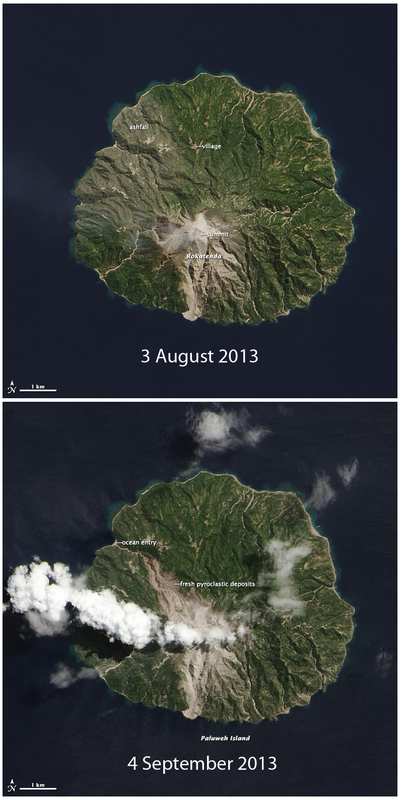 NASA-EO captured images before and after the 10 August 2013 eruption where the path of the pyroclastic flow to the NW is clearly visible (figure 9). Figure 9. NASA-EO images of Paluweh (Mt. Rokatenda) on 3 August and 4 September 2013, before and after a large eruption with a deadly pyroclastic flow that traveled NW from the summit to the ocean, killing 5 people at the beach on 10 August. The delta on the S of the island was created during an earlier eruption and pyroclastic flow on 2-3 February 2013. Courtesy of NASA Earth Observatory ( http://earthobservatory.nasa.gov/IOTD/view.php?id=81986). Activity during 2014-2016. In April 2014, PVMBG noted that the last major explosion had been on 10 August 2013. The last 2013 ash plume recorded by the Darwin VAAC was on 12 August 2013. Visual observations of occasional eruptive activity were noted until November 2013; small explosion earthquakes were also reported as being last recorded in November. No changes were observed in the lava dome between September 2013 and March 2014. PVMBG lowered the Alert level from III to II (on a scale of 1-4) on 7 April 2014. No additional reports of activity at Paluweh appeared until late 2015, when PVMBG noted that steam plumes rising 75-200 m above the summit were common between August and October 2015. Seismicity remained low but variable during this time as well. From November 2015 through January 2016, steam plume heights ranged from 5-150 m. Seismicity remained low; earthquakes indicating rock avalanches and fumarolic emissions were the most common type recorded (figure 10). Paluweh remained quiet throughout 2016, although in February 2017 it was still listed by PVMBG at Alert Level II, with a potential for eruptive activity. Figure 10. Seismic activity at Paluweh between 1 January 2015 and 13 January 2016. Vertical Axis represents daily number of events for all graphs. Guguran are avalanche events, Hembusan are emission-related events, Vulkanik Dangkal (VB) are shallow volcanic events, Vulkanik Dalam (VA) are deep volcanic events, Tektonik Local are local tectonic events, and Tektonik Jauh are distant tectonic events. Courtesy of PVMBG (Paluweh report, 18 January 2016). Information Contacts: Pusat Vulkanologi dan Mitigasi Bencana Geologi (PVMBG, also known as Indonesian Center for Volcanology and Geological Hazard Mitigation, CVGHM), Jalan Diponegoro 57, Bandung 40122, Indonesia (URL: http://www.vsi.esdm.go.id/); Darwin Volcanic Ash Advisory Centre (VAAC), Bureau of Meteorology, Northern Territory Regional Office, PO Box 40050, Casuarina, NT 0811, Australia (URL: http://www.bom.gov.au/info/vaac/); Hawai'i Institute of Geophysics and Planetology (HIGP), MODVOLC Thermal Alerts System, School of Ocean and Earth Science and Technology (SOEST), Univ. of Hawai'i, 2525 Correa Road, Honolulu, HI 96822, USA (URL: http://modis.higp.hawaii.edu/); NASA Earth Observatory, EOS Project Science Office, NASA Goddard Space Flight Center, Goddard, Maryland, USA (URL: http://earthobservatory.nasa.gov/). PVMBG reported that observers at a post located in Kampung Ropa, Keliwumbu Village, noted that during 1 August-2 November diffuse white plumes rose as high as 200 m above Paluweh. Seismicity remained relatively stable. The Alert Level remained at 2 (on a scale of 1-4). Residents and tourists were reminded not to approach the summit within a radius of 1.5 km. PVMBG reported that observers at a post located in Kampung Ropa, Keliwumbu Village, noted that during January-5 April activity at Paluweh mainly consisted of white and gray fumarolic plumes rising at most 100 m above the lava dome and drifting W, N, and E. The report stated that the lava dome had not changed between September 2013 and March 2014 observations. Seismicity had decreased in November 2013 and remained low; the number of avalanches had also decreased. On 7 April the Alert Level was lowered to 2 (on a scale of 1-4). According to news articles, a partial lava-dome collapse at Paluweh on 10 August generated a pyroclastic flow that traveled N towards a beach village and killed at least 5 people. A volcanologist at the monitoring post for Paluweh noted that the eruption lasted seven minutes, and that the pyroclastic flow burned trees around the beach and villages, making it difficult to reach the victims. Pyroclastic flows continued to be reported hours after the initial eruption. Based on analyses of satellite imagery and wind data, the Darwin VAAC reported that an ash plume rose to an altitude of 4.3 km (14,000 ft) a.s.l. and drifted 130 km W.
News sources noted that a mandatory evacuation order had caused some residents to evacuate prior to the eruption on 10 August, but nearly10,000 still remained on the island. After the eruption, a rescue team was sent to evacuate about 2,000 people that remained inside a 3-km exclusion zone. A team member noted that rescuing people was difficult since they were reluctant to leave their livestock and homes, but also that the ground was hot and covered in 10-20 cm of ash. The VAAC reported that during 11-12 August ash plumes rose to an altitude of 1.8 km (6,000 ft) a.s.l. and drifted 110-130 km W. A news article noted that the eruptions were smaller on 12 August, but pyroclastic flows continued to be observed. The Alert Level remained at 3 (on a scale of 0-4). Based on analyses of satellite imagery and wind data, the Darwin VAAC reported that on 13 May ash plumes from Paluweh rose to an altitude of 2.1 km (7,000 ft) a.s.l. and drifted over 90 km WNW and NW. Based on analyses of satellite imagery and wind data, the Darwin VAAC reported that during 29-30 April ash plumes from Paluweh rose to altitudes of 2.1-3 km (7,000-10,000 ft) a.s.l. and drifted 35-110 km NW and W.
Based on analyses of satellite imagery and wind data, the Darwin VAAC reported that on 20 April an ash plume from Paluweh rose to an altitude of 2.1 km (7,000 ft) a.s.l. and drifted 45 km NW. Based on analyses of satellite imagery and wind data, the Darwin VAAC reported that on 16 April an ash plume from Paluweh rose to an altitude of 2.1 km (7,000 ft) a.s.l. and drifted 37 km E.
Based on analyses of satellite imagery and wind data, the Darwin VAAC reported that on 3 April an ash plume from Paluweh rose to an altitude of 2.1 km (7,000 ft) a.s.l. and drifted 37 km SE and W. During 6-7 April ash plumes rose to an altitude of 3 km (10,000 ft) a.s.l. and drifted over 45 km W and WSW. Based on analyses of satellite imagery and wind data, the Darwin VAAC reported that during 27 March-1 April ash plumes from Paluweh rose to altitudes of 2.4-3.7 km (8,000-12,000 ft) a.s.l. and drifted 45-100 km N, NE, and E.
Based on analyses of satellite imagery and wind data, the Darwin VAAC reported that during 19-21 and 24-26 March ash plumes from Paluweh rose to an altitude of 3 km (10,000 ft) a.s.l. and drifted 55-335 km SW, WSW, W, NW, and NE. Based on analyses of satellite imagery and wind data, the Darwin VAAC reported that duirng 13 and 17-19 March ash plumes from Paluweh rose to altitudes of 2.4 km (7,000-13,000 ft) a.s.l. and drifted 35-95 km E, W, and WNW. CVGHM reported that activity at Paluweh during October 2012-January 2013 was characterized by lava-dome growth, incandescent avalanches, pyroclastic flows, ash plumes that rose as high as 4 km above the dome, and ejected material deposited 3 km away. The whole island was affected by ashfall, which was an average of 2 cm thick on some areas. Some infrastructure and several homes were damaged by ash and lahars. On 1 February at 1652 an eruption generated an ash plume that rose 2 km. Pyroclastic flows and avalanches were observed. On 2 February an explosion produced an ash plume that rose 4 km and was accompanied by booms and rumbling. The ash plume drifted S and deposited ashfall up to 1 mm thick in Ende (60 km S); thick ashfall was reported in Ona (SE part of the island) and thin deposits were reported in other areas of the island to the W, N, and E. About 25% of the S portion of the dome was lost; the lava-dome volume was an estimated 5.1 million cubic meters on 13 January. On 3 February an ash eruption was observed as well as incandescence from the crater. During 4-10 February diffuse white plumes rose 50-100 m. The Alert Level remained at 3 (on a scale of 1-4), and visitors and residents were prohibited from approaching the crater within a 3-km-radius. Based on analyses of satellite imagery and wind data, the Darwin VAAC reported that during 17-18 February ash plumes rose to an altitude of 7 km (13,000 ft) a.s.l. and drifted 75 km E and NE. According to news articles, an explosion from Paluweh occurred at 2300 on 2 February and was clearly heard by local residents. Authorities evacuated by boat all residents from the eight villages on the island. Ashfall was reported during 2-3 February. Based on analyses of satellite imagery, wind data, and pilot reports, the Darwin VAAC reported that on 3 February ash plumes from Paluweh rose to altitudes of 13.1-13.7 km (43,000-45,000 ft) a.s.l. and drifted 325-590 km SE, S, and SW. Elevated levels of sulfur dioxide were also detected. The next day ash plumes at an altitude of 7.6 km (25,000 ft) a.s.l. were observed. Based on analyses of satellite imagery and wind data, the Darwin VAAC reported that during 19 and 21-23 December ash plumes from Paluweh rose to altitudes of 2.4-2.7 km (8,000-9,000 ft) a.s.l. and drifted 55-75 km E, SW,W, and NW. Based on analyses of satellite imagery and wind data, the Darwin VAAC reported that on 6 and 8 December ash plumes from Paluweh rose to an altitude of 3.7 km (12,000 ft) a.s.l. and drifted 35-75 km NW, W, and SW.
Based on analyses of satellite imagery and wind data, the Darwin VAAC reported that during 28 November-4 December ash plumes from Paluweh rose to altitudes of 1.5-2.4 km (5,000-8,000 ft) a.s.l. and drifted 35-65 km NW and W.
The Volcano Discovery team observed Paluweh during 30 November-2 December. They reported that a lava dome seemed to be visibly growing from all sides, with almost constant incandescent rockfalls in multiple areas. The dome was about 150 m high, the highest point on the island, and the basal diameter was 200-250 m. A vent on the upper E part of the dome ejected ash for periods of several hours and produced jet-like degassing sounds. A steam-and-ash plume rose several kilometers. Small pyroclastic flows descended the lava dome, but vegetation immediately surrounding the dome was only slightly damaged by fires caused by hot blocks and ashfall. The report also noted that local people observed the dome growing next to the Rokatenda crater in late October. Based on analyses of satellite imagery and wind data, the Darwin VAAC reported that during 21 and 23-27 November ash plumes from Paluweh rose to altitudes of 2.4-3 km (8,000-10,000 ft) a.s.l. and drifted 35-115 km WNW, W, and SW.
Based on analysis of satellite imagery, the Darwin VAAC reported that during 14-19 November ash plumes from Paluweh rose to altitudes of 2.4-3 km (8,000-10,000 ft) a.s.l. and drifted 45-150 km NW and W. A thermal anomaly was detected on 14 November. Based on analysis of satellite imagery and other data, the Darwin VAAC reported that during 11-13 November ash plumes from Paluweh rose to an altitude of 2.4 km (8,000 ft) a.s.l. and drifted 90-150 km NW and W.
During 1-17 April, seismic activity from Paluweh increased, prompting CVGHM to raise the Alert Level to 1 (on a scale of 1-4) on 18 April. News reports of an increase in volcanic activity at Paluweh (also known as Rokatenda) on 31 January were found to be false by DVGHM. DVGHM staff found no activity at the volcano, so it remained at Alert Level 1. According to Mrs. Suryanti, a correspondent of the Vulcain Group in Indonesia, on 9 and 16 January the crater of the Paluweh Island volcano, named Rokatinda, was throwing gases, ash, and bombs to a height of about 100 m. As a consequence the greater part of the vegetation, coconut trees, and maize was burned and destroyed. Before the eruption, the volcano had displayed weak fumarolic activity. When Maurice Krafft visited this volcano in October 1971, the maximum temperature of the gases escaping from the crater was 100°C. About 2,000 people are living on the island of Paluweh. Information Contacts: N. Suryanti, Djakarta II, Indonesia; Maurice Krafft, Equipe Vulcain, Mulhouse, France. Activity began to increase on 5 November and continued intermittently through the end of January. On 9 November, an eruption column rose 1 km from the summit crater. Bombs fell nearby and 2 mm of ash were deposited 1 km to the W. Bombs and ash were ejected for about 15 minutes starting at 1115 on 13 November, from a summit crater vent [but see 6:2] 40 m in diameter. The tephra column reached 700 m in height. On 27 January ejecta set bushes afire near a flank village. Detonations from explosions on 31 January were heard at Kota Baru, Flores Island . . . at 0740, 0803, 0807, 0913, 1030, and 1215. No additional activity had occurred as of 5 February. VSI provided further details about the intermittent explosive activity. The 40-m-diameter vent was formed during one of the early November eruptions and is situated on the upper NNE flank. Bombs from the 1-km-high eruption column on 9 November measured up to 60 cm in diameter. Beginning 18 January renewed activity was reported. A hot air wave was felt by the inhabitants of two E-flank villages. About 1,850 persons were evacuated from the danger zone. After the explosions on 31 January a new lava dome was observed in the crater. Activity declined gradually, and the volcano appeared to be normal again on 1 February at 1200. No casualties from Paluweh's November-January activity were reported. Indonesian Meteorological Institute personnel reported that Paluweh has erupted for the second time this year. The meteorology bureau on Flores Island . . . said it recorded 809 "strong tremors" 17-22 August. "Lava and burning rocks" were repeatedly erupted on 22 August. On 24 August the bureau recorded ocean water temperatures as high as [98°C] around the island. No casualties were reported, but inhabitants evacuated the area. Crops and fishing boats were damaged. No pyroclastic flows were observed during the growth of the lava dome first seen 31 January (although some sliding occurred), but it generated blasts of hot air felt by residents of a flank village. They were evacuated by the end of February, after VSI had issued a volcanic hazard warning. By July, the lava dome was 200 m high, its volume exceeded 8.5 x 106 m3, and its summit had become the highest point on the volcano at 875 m above sea level. Explosive activity resumed on 5 September between 2010 and 2105, producing a 1-km-high plume. This activity was followed by the destruction of the lava dome. Pyroclastic flows and nuées ardentes d'avalanche moved downslope, depositing 5-20 cm of tephra at one village, and starting fires at 36 structures, including a church and five shelters, at another. Because residents had previously been evacuated, there were no casualties. Since the destruction of the dome, the 3-component seismograph monitoring the volcano has recorded shallow earthquakes which VSI believes may be generated by sliding from remnants of the dome. During 1-17 April 2009, seismicity increased at Paluweh (table 1), prompting the Center of Volcanology and Geological Hazard Mitigation (CVGHM) to raise the Alert Level from 1 to 2 (Waspada) on 18 April. CVGHM staff in the observation post did not see any gas or ash emissions. Visitors were requested to stay away from the active crater adjacent to the peak. Table 1. Average number of daily seismic events recorded from Paluweh, April 2009. Courtesy of CVGHM. Explosive activity had most recently been observed in May 1984 and previously during November 1980-September 1981 (SEAN 06:01, 06:02, 06:08, and 06:09), October 1973, and October 1972-January 1973. Activity in December 1963-March 1966 included lava flows, pyroclastic flows, and fatalities. An unconfirmed news report of activity in January 2005, not reported in the Bulletin, was later found to be false. The CVGHM staff found no activity at the volcano. As background on hazard considerations, the mouth of the principal crater opens to the S, where there is plantation agriculture almost to the volcano's peak. In the advent of a future crisis, evacuation would be complicated because a safer area is about two hours journey by motor vessel, and leaving the island might not be possible during storms or rough seas. CVGHM is in continuous contact with the provincial and regional governments, some monitor of Paluweh occurs from the hamlet of Ropa on the N-central coast of the big island of Flores, to Paluweh's S. Regional civil-defense agencies (such as SATKORLAK-PB, the Provincial Coordinating Unit for Disaster Management) and district government agencies of Sikka and Ende (such as SATLAK-PB, the Local Coordinating Body for Disaster Relief) are continually apprised of the activity level. This report discusses the time interval from April 2009 to early 2014, during which time Paluweh (also known as Mount Rokatenda) had vigorous explosive activity in late 2012 with dome emplacement [noted in early] October 2012. A 3 February 2013 ash plume rose to over 13 km in altitude and drifted 325-590 km SE, S, and SW. By 7 February, portions of the growing dome's S flank detached. On 10 August 2013 a pyroclastic flow killed at least 5 people on the island's N shore. The dome remained unchanged during September 2013 through at least March 2014. Table 2 summarizes key data describing Paluweh from 17 June 2011 to 8 April 2014. In addition, Volcano Discovery showed photos attributed to local resident Ignatius Cua. They noted that Cua "reported that a small zone of dead vegetation associated with new fumarolic activity had developed in the summit region in June 2012. It appears that lava extrusion commenced at or near this zone in mid-October, marking the beginning of the 2012 eruption." Table 2. Summary of activity recorded for Paluweh from 17 June 2011 through 8 April 2014. The information was compiled from the Indonesian Center for Volcanology and Geologic Hazard Mitigation (CVGHM) and the Darwin Volcanic Ash Advisory Centre (VAAC). Jan 2011-Jun 2011 -- In their 20 June 2011 report, CVGHM said that tremor had been absent since 1 March 2010 and during January 2011-June 2011, they did not see solfatara emissions from the summit. On 17 June 2011, the Alert Level was lowered to 1 (on a scale of 1-4). 18 Jan 2012 -- In their 25 January report, they noted that on 18 January 2012 there were 60 shallow volcanic earthquakes. Fog prevented visual observations. 8-13 Oct 2012 -- On 8 October 2012, the Alert rose from I to II; on 13 October 2012, it rose from II to III. Later reports noted dome growth had begun (see text). Early Jan 2013 -- By 13 Jan 2013 there had been 5.1 x 106 m3 of dome loss. 03 Feb 2013 Ash plume to 13.1-13.7 km altitude drifting 325-590 km SE, S, and SW. 1-3 Feb. 2013. Pyroclastic flows and ashfall. Early Feb 2013 -- By 7 Feb 2013 substantial parts of the S flank of the lava dome had been removed. 17-18 Feb 2013 Ash plume to 7 km altitude drifting E and NE. See text. January-5 Apr 2014 -- Activity mainly consisted of white and gray fumarolic plumes rising at most 100 m above the lava dome and drifting W, N, and E. During September 2013 to March 2014, the lava dome remained static. A photo of the dome taken in 2012 appears in figure 1. CVGHM reported that activity at Paluweh during October 2012-January 2013 was characterized by lava-dome growth and incandescent avalanches, pyroclastic flows, and ash plumes rising as high as 4 km above the dome. Ejected material was deposited 3 km away. The whole island was affected by ashfall, which was an average of 2 cm thick on some areas. Some infrastructure and several homes were damaged by ash and lahars. Figure 1. The unstable lava dome at Paluweh seen behind the older dome (the dark slope in the foreground in a night photo). Just prior to the photo, a large block broke off the dome's left side (upper E flank). In the aftermath, seen here, molten material gushed from the dome's interior. Photo is from December 2012. The portion of the dome seen here is on the order of 100-150 m high (from the dark basal region at right to the top. Photo courtesy of Tom Pfeiffer, Volcano Discovery. The Darwin Volcanic Ash Advisory Centre (VAAC) reported a 3 February 2013 eruption that was outstanding in terms of altitude of the ash plume's top and the lateral distance the plume was visible in satellite imagery. The plume rose to 13.1-13.7 km and drifted 325-590 km SE, S, and SW. Eruptions around this time were also noted by news articles, some of which mentioned ashfall. The Darwin VAAC tracked the number of volcanic ash advisories for Paluweh in comparison to 14 other volcanoes during the interval January through November 2013 (figure 2). They issued 230 VAAs for Paluweh, the second highest number for any one of the 14 volcanoes they discussed during this interval. Figure 3 shows the extent of plumes as delineated in VAAs for the same interval. As further background, figure 4 shows that during the interval 1 July 2008 through 30 June 2014 the Darwin VAAC issued approximately 800 to 1500 VAAs each year. Those advisories have bearing on delays on air travel and transport as well as on plume-derived impacts to the atmosphere. Figure 2. A histogram showing volcanoes reported by the Darwin VAAC during an 11-month period January 2013 to November 2013. In that interval, Paluweh was the subject of 230 VAAs - the second largest number or 21% of the total 1,092 VAAs on eruptions during the same interval. The 4 cases labeled 'Test' were issued in order to check the operational functionality of the system and were excluded from the total. Courtesy of the Darwin VAAC (see ICAO, 2014). Figure 3. A graphical summary of Darwin VAAC's reports (VAAs) issued during period January 2013 to November 2013 showing the boundaries of airspace containing ash plumes (red to red-brown polygons). Paluweh is the southernmost volcano shown and the source of the large plumes, with some restricted to the Lesser Sunda Islands and others approaching and lapping over NW Australia. Batu Tara volcano, which is adjacent and NW of Paluweh, was the source of more VAA reports than Paluweh but most of the plumes were comparatively restricted during this time interval. Courtesy of the Darwin VAAC (see ICAO, 2014). Figure 4. Number of VAAs issued by Darwin VAAC during July 1993 to 12 since 1 July 1993 to December 2014. Note that the Australian fiscal year runs from 1 July to 30 June. Courtesy of the Darwin VAAC (see ICAO, 2014). Figure 5 shows a Paluweh plume on 10 August 2013 courtesy of the Darwin VAAC. The VAAC reported that during 11-12 August 2013 Paluweh's ash plumes rose to an altitude of 1.8 km and drifted 110-130 km W. A news article noted that the eruptions were smaller on 12 August 2013, but pyroclastic flows continued to be observed. The Alert Level remained at 3 (on a scale of 0-4). Figure 5. A photo taken looking N from the Maurole district of East Nusa Tenggara province with a camera phone; it shows Paluweh emitting an inclined column of hot ash on 10 August 2013. Photo courtesy of Agence France Presse/Scantix. Dome collapse animation. A Volcano Discovery team observed Paluweh during 30 November-2 December 2012 and captured some images that can help authorities explain the processes and attendant hazards associated with unstable growing domes (figure 6). Richard Roscoe (Photovolcanica) made the source animation from a few shaky handheld photos of a dome lobe collapse during daylight on unstated date during his visit. These images were taken from a similar perspective as figure 1. He estimated the entire new dome as on the order of 200 m (at most) from base to top. He thought that the size of collapse (in the red circle on figure 6 (b)) as "maybe about 10-20 m high." Regarding the termination of the collapse event, he stated that the material travelling off-frame hit the base of the old dome and then stopped abruptly as it encountered the old dome's wall (the far side of the sloping ridge in the foreground). Figure 6. Dome instability generating a small pyroclastic flow at Paluweh. Bulletin editors composed frames b-f by taking a series of screenshots from an animation made using hand-held photos by Richard Roscoe (Photovolcanica). (a) The larger dome is seen and the yellow box shows the area of the other frames. (b) The area in red delineates the part of the dome's surface that later collapsed, an area described as a small extrusion lobe (see text). Successive photos below came from later parts of the animation. The sequence can help those less familiar with this process to visualize the scale, kinetic energy, high heat-capacity, mobility, and destructive power of the resulting pyroclastic flow. Used with permission from Richard Roscoe (Photovolcanica). For more details, including other frames, contact the Roscoe. Volcano Discovery reported that Paluweh's lava dome seemed to be visibly growing on all sides, with almost constant incandescent rockfalls in multiple areas. The new dome, called Rerombola lava dome, was ~150 m high, the highest point on the island, and the basal diameter was 200-250 m. During their stay, a vent on the upper E part of the dome ejected ash for periods of several hours and produced jet-like degassing sounds. A steam-and-ash plume rose several kilometers. At the base of the dome, hot blocks had ignited local vegetation. February 2013 has largest plumes of the reporting interval. According to CVGHM, on 1 February 2013 at 1652 an eruption generated an ash plume that rose 2 km. Pyroclastic flows and avalanches were observed. On 2 February an explosion produced an ash plume that rose 4 km and was accompanied by booms and rumbling. The ash plume drifted S and deposited ash up to 1 mm thick in East Nusa Tenggara island (Ende, 60 km S); ash was also reported in Ona (SE part of the island) and thin deposits were reported in other areas of the island to the W, N, and E. Significant portions of the S dome were lost. Prior to this, on 13 January 2013, the lava-dome volume was an estimated 5.1 million cubic meters. Based on analyses of satellite imagery, wind data, and pilot reports, the Darwin VAAC reported that on 3 February 2013 ash plumes from Paluweh rose to altitudes of 13.1-13.7 km a.s.l. and drifted 325-590 km SE, S, and SW. The next day ash plumes at an altitude of 7.6 km a.s.l. were observed. As a result of the eruption the whole island was affected by ashfall, which was an average of 2 cm thick in some areas. Some infrastructure and several homes were damaged by ash and lahars. Beyond Indonesia, the ash plumes from the 3 February eruption caused significant impacts. They caused a series of flight delays and related impacts on the tourist and aviation industries as they advanced towards and eventually came over the Kimberley coast in Western Australia (larger polygons on figure 3). During 4-10 February diffuse white plumes rose 50-100 m. The Alert Level remained at 3 (on a scale of 1-4), and visitors and residents were prohibited from approaching the crater within a 3-km-radius. Landsat visible and thermal data. A NASA Earth Observatory report posted online showed images of Paluweh from 29 April 2013. A visible wavelength image from the Landsat Data Continuity Mission's Operational Land Imager instrument shows an ash plume drifting ~50 km NE of the volcanic island. A thermal infrared image from the same satellite showed a small hot spot surrounded by cooler dark ash clouds. Deadly 10 August 2013 pyroclastic flows. As activity persisted in the ~10 months prior to the 10 August eruption, authorities repeatedly tried to persuade residents to relocate to safer areas. Although reports regarding evacuations are variable, the Indonesian National Board for Disaster Management (BNPB) reports that about a quarter of the island's total residents had been permanently moved to nearby Flores Island since the onset of activity in October 2012. Thus, of 10,858 total island residents, about 2,700 had moved. After the 10 August eruption, the BNPB source said that at least another 1,203 had moved by 30 August. News sources also indicated that around the time of the pyroclastic flows, a volcanologist at the monitoring post for Paluweh noted that the deadly phase of the 10 August 2013 eruption lasted 4-7 minutes. Pyroclastic flows burned trees around the beach and villages, making it difficult to reach victims. BBC News Asia report on 10 August stated six dead, four adults and two children. Regarding timing of the eruption, they quoted a CVGHM source: "Mr Surono said the latest eruption had begun at 04:27 on Saturday [10 August] (20:27 GMT Friday [9 August]) and lasted for nearly four hours." Official sources also indicated that pyroclastic flows continued hours after the initial eruption. The Jakarta Post article gave the death toll as at least five. It stated the specific location of the deaths as "Woje Wubi to Punge beach in Rokirole village." According to news sources, after the 10 August eruption a rescue team was sent to evacuate about 2,000 people that remained inside the 3-km exclusion zone. The news reports said that a team member described rescuing people as difficult because they were reluctant to leave their livestock and homes, but also that the ground was hot and covered in 10-20 cm of ash. Tempo.co news issued a report in Indonesian saying that a total of 12 residents began to be evacuated from the town of Maumere, the capital of the district, as a result of the 10 August eruption. This source indicated six fatalities. It said that two motorboats had successfully evacuated hundreds of residents of four villages. Based on analyses of satellite imagery and wind data, the VAAC reported during 10 to 13 August 2013 that an ash plume rose to an altitude of 4.3 km and drifted 130 km W.
The summit crater opens to the S and large-scale production of crops (plantation agriculture) extends almost to the volcano's peak. This southerly path is typically followed by pyroclastic flows from the dome. In contrast, the 10 August pyroclastic flow traveled down the N flank of the volcano, descending into beachside villages. Reference: International Civil Aviation Organization (ICAO), 2014, The Twelfth Meeting Of Asia/Pacific Robex Working Group (Robex Wg/12) and Fourth Meeting Of Meteorological Hazards Task Force (MET/H TF/4), ROBEX WG/12 / MET/H TF/4 - IP/C2, 2014, Agenda Item (conjoint session; 2d; 11/03/14); ICAO Regional Sub-Office, Beijing, China 19 March 2014, ICAO, 18 pp. [URL: http://www.icao.int/APAC/Meetings/2014 METHTF4/IP-C2_ICAO_AI.C2d - Darwin VAAC Report - AUS.pdf]. Information Contacts: BNPB (the Indonesian National Board for Disaster Management) [Informasi Penanggulangan Bencana Terkini di Indonesia], Gedung Graha 55 Jl. Tanah Abang II No. 57, Jakarta, Indonesia (URL: http://www.bnpb.go.id/); Center of Volcanology and Geological Hazard Mitigation (CVGHM), Jalan Diponegoro 57, Bandung 40122, Indonesia (URL: http://www.vsi.esdm.go.id/); Darwin Volcanic Ash Advisory Centre (VAAC), Bureau of Meteorology, Northern Territory Regional Office, PO Box 40050, Casuarina, NT 0811, Australia (URL: http://www.bom.gov.au/info/vaac/); NASA Earth Observatory, EOS Project Science Office, NASA Goddard Space Flight Center, Goddard, Maryland, USA (URL: http://earthobservatory.nasa.gov/); Volcano Discovery (URL: http://www.volcanodiscovery.com/); and Richard Roscoe, Photovolcanica (URL: http://www.photovolcanica.com/). Paluweh volcano, also known as Rokatenda, forms the 8-km-wide island of Palu'e north of the volcanic arc that cuts across Flores Island. The broad irregular summit region contains overlapping craters up to 900 m wide and several lava domes. Several flank vents occur along a NW-trending fissure. The largest historical eruption occurred in 1928, when strong explosive activity was accompanied by landslide-induced tsunamis and lava dome emplacement. Pyroclastic flows in August 2013 resulted in fatalities. Neumann van Padang M, 1930. Padoweh. Vulk Seism Meded Dienst Mijnw Ned-Indie, 11: 1-141. There is no Deformation History data available for Paluweh. 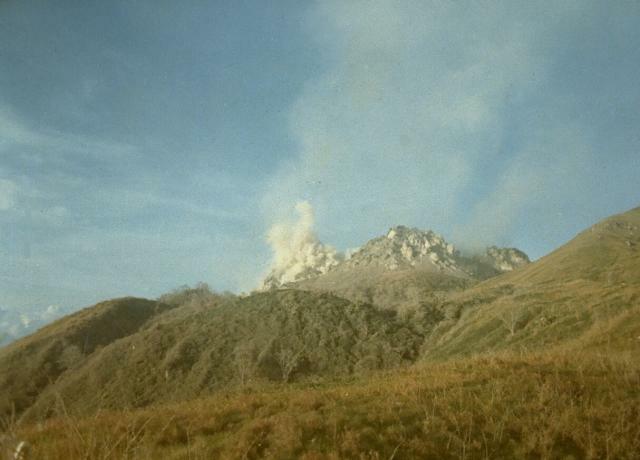 A small plume rises from a lava dome at the summit of Paluweh volcano, seen here in 1985 from the south. The dome is one of several lava domes emplaced during historical time at Paluweh volcano. Paluweh volcano is seen here in April 1985, shortly after a brief explosive eruption from a vent near the 1981 lava dome. Paluweh volcano, also known as Rokatenda, forms an 8-km-wide island located north of the volcanic arc that cuts across Flores Island. The summit region contains overlapping craters and lava domes; several flank vents occur along a NW-trending fissure. The largest historical eruption of Paluweh occurred in 1928. Photo by Sumailani, 1985 (Volcanological Survey of Indonesia). The broad forested 8-km-wide island of Paluweh is seen here from off its NE coast. A rounded lava dome forms the summit of the volcano, sometimes known as Rokatenda. A new lava dome in the summit of Paluweh volcano is viewed from the north in 1964. An explosive eruption began on December 31, 1963, and the following day a lava dome was seen between the 1928 dome and the north crater wall. Occasional explosive eruptions accompanied by avalanches from the dome continued into 1966. The last reported activity was on March 16, 1966, when a large avalanche produced ashfall on the west side of the island, damaging cultivated areas. Photo by J. Matahelumual, 1964 (published in Kusumadinata 1979 "Data Dasar Gunungapi Indonesia"). An unvegetated lava dome is visible at the summit of Paluweh volcano, also known as Rokatenda. The complex stratovolcano forms an 8-km-wide island located north of the volcanic arc that cuts across Flores Island. The summit region contains overlapping craters and lava domes; several flank vents occur along a NW-trending fissure. The largest historical eruption of Paluweh occurred in 1928. There are no samples for Paluweh in the Smithsonian's NMNH Department of Mineral Sciences Rock and Ore collection. IRIS seismic stations/networks Incorporated Research Institutions for Seismology (IRIS) Data Services map showing the location of seismic stations from all available networks (permanent or temporary) within a radius of 0.18° (about 20 km at mid-latitudes) from the given location of Paluweh. Users can customize a variety of filters and options in the left panel. Note that if there are no stations are known the map will default to show the entire world with a "No data matched request" error notice. 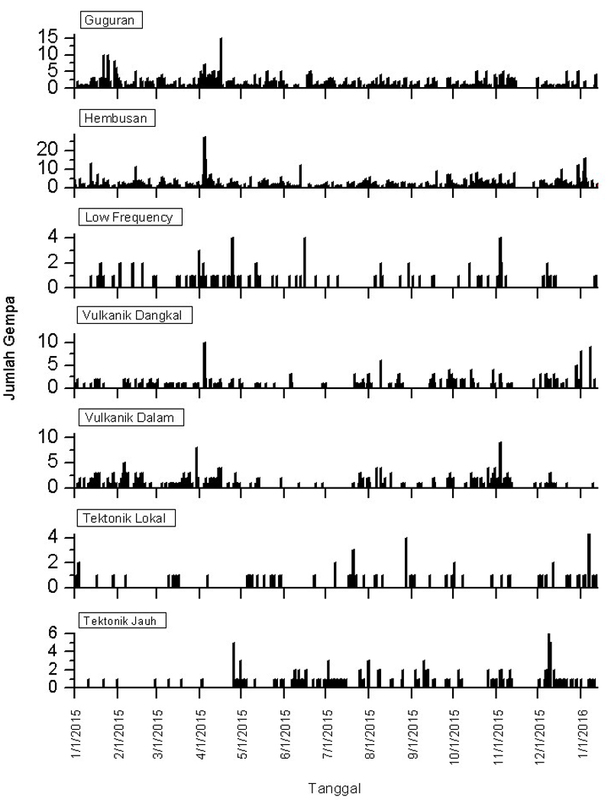 Large Eruptions of Paluweh Information about large Quaternary eruptions (VEI >= 4) is cataloged in the Large Magnitude Explosive Volcanic Eruptions (LaMEVE) database of the Volcano Global Risk Identification and Analysis Project (VOGRIPA).